Is Your Washer a Flood Waiting to Happen? Went on a service call the other day for a refrigerator. And, in one of those, “While you’re here…” things, I ended up checking out the washer and dryer. Something I always, always check when working on a washer are the fill hoses. 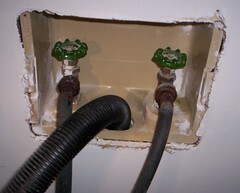 The cheap, stamped-brass fittings on the black rubber fill hoses were badly rusted and, in that weakened condition, were more prone to snap or split, causing a huge flood in this million-dollar lake house. So I pulled those hoses off… actually, the fittings were so badly rusted that they no longer rotated so I had to cut ’em off with the big serrated-edge knife in my Leatherman Wave that I keep on my belt when I’m running service calls. 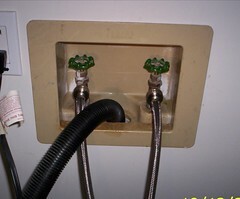 Then I installed a beautiful, brand-new pair of stainless-steel braided fill hoses with stainless steel fittings. The only additional charge was for the retail price of the new hoses. Cheapest flood insurance you can buy! This entry was posted in Washer Repair on October 26, 2005 by Samurai Appliance Repair Man.